Jactalea are a French publisher who have published a number of abstract games notable for their use of leather components. The most recent game, Splits, has included wooden pieces and the most recent printings of many of their titles substitute a thick foam for the pieces and retain a leather playing mat. There are nicely done iOS versions of several of the Jactalea titles including Mana and Kamon to make it even easier to carry a copy around with you. 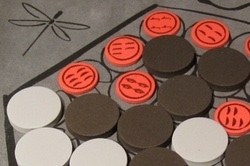 Splits, a game of territory control on a variable hex board. Players must choose how to divide up one of their stacks of discs each move to ensure they always have an opportunity and resources to capture territory and avoid being cut off. Mana, In this game, the identity of the pieces is defined by the space they sit on. Depending on the space, pieces can move between 1 and 3 spaces, then the opponent must move a piece from a square matching the landing square. The goal of the game is the capture of a king piece as part of one of these moves. Khan Tsin, A game of creating stacks. Each player works their way along a chain of pieces, picking up pieces and moving them to a new stack. As the stacks get higher, they each try to create a stack of three of each colour piece without creating an opportunity for their opponent to steal the tower first.